Australian made, owned & designed baby skin care company, Bubba Organics has released their highly anticipated new range of May Gibbs branded products, consisting of three co-branded individual baby skin care essentials – Baby Hair & Bath Wash (RRP: $24.95), Baby Moisture Lotion (RRP: $26.95) and Baby Bottom Cream (RRP: $25.95). The perfect new baby gift, a baby skincare gift box featuring all three products is also available (RRP: $79.95). In keeping with the natural and organic values of the two brands, the products are lightly scented with the beautiful essential oils of rose geranium and enriched with nature’s highest source of Vitamin C, Australian Kakadu Plum with Marshmallow. May Gibbs Australian Kakadu Plum & Marshmallow Baby Hair & Bath Wash 250ml by Bubba Organics is enriched with nature’s highest source of Vitamin C and is full of antioxidants to help protect baby’s sensitive skin. Our pure natural ingredients of Aloe Vera, Rose Geranium Oil and Jojoba will gently cleanse & hydrate, assisting to keep baby’s hair & skin soft and healthy. is a beautiful soft lotion specially formulated for babies and enriched with premium natural ingredients of Aloe Vera, Rose Geranium Oil and Sweet Almond Oil. Perfect for baby massage, Bubba Organics baby moisture lotion will gently soothe, moisturise and protect bubba’s delicate skin. is rich in Vitamin C assisting to soothe & protect sensitive skin. Pure natural ingredients of Aloe Vera, Rose Geranium Oil & Shea Butter will gently calm and safely nourish baby’s delicate bottom area. Bubba Organics creates extra gentle, 100% natural, baby skin care essentials that mums can trust and babies love. Our pure, natural, organic by nature skin care is naturally safe for new skin making it the best choice from day one and everyday thereafter for all the family. Our premium range has been created to gently soothe, calm and safely nourish and each product is ECO friendly and made from the best locally sourced natural ingredients providing you with peace of mind. 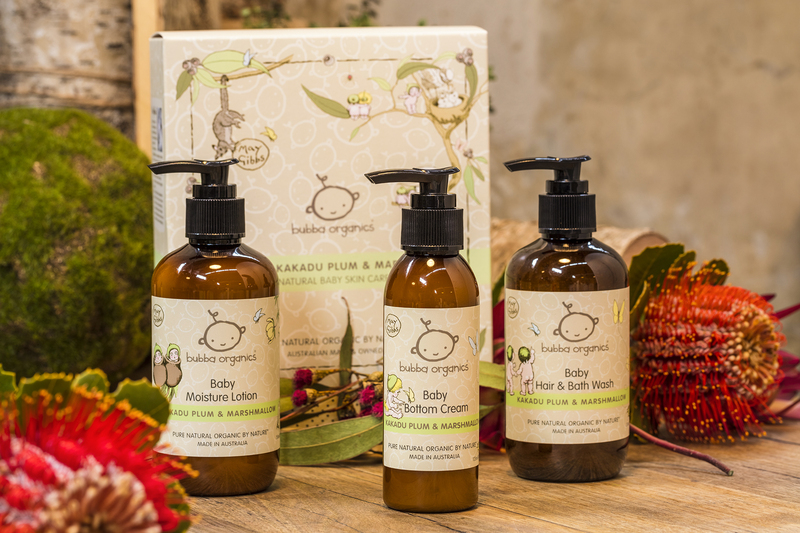 Every product in the Bubba Organics range is planet safe, not tested on animals and free from nasties. They are an ECO award winning brand that lovingly creates, designs and ethically manufactures all products in Melbourne, Australia. Bubba Organics is also a proud member of the Australian Made campaign providing confidence that they are truly Australian made & owned.